It’s the holiday season. December 1. No decorations, Christmas music, nor holiday food allowed before that date at my house. I am quite strict. 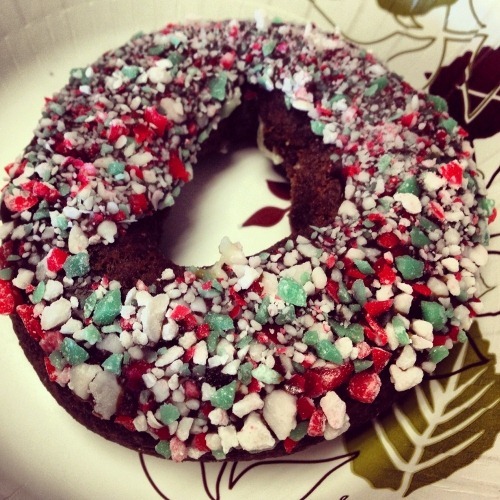 Okay, so I bent the rules earlier this week and ate a holiday-themed donut at work. Also have got to give a shout out to the adorable Christmas tree located in the entrance to my office building! 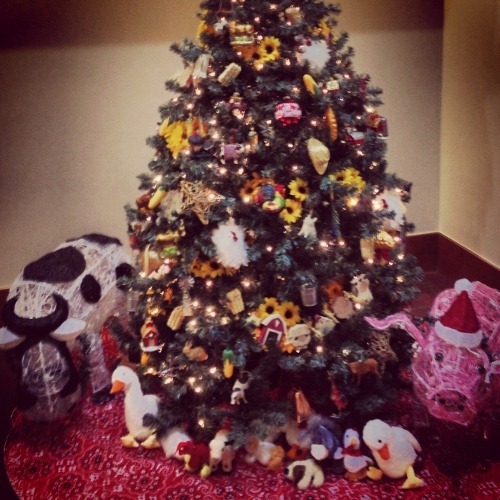 My office is located across the street from a petting farm, and the office Christmas tree is themed as such! Covered in the sunflowers that grow near my office every August, and decorated with donkeys, bison, pigs, barns, bales of hay, and more, this is one of the cutest trees ever. 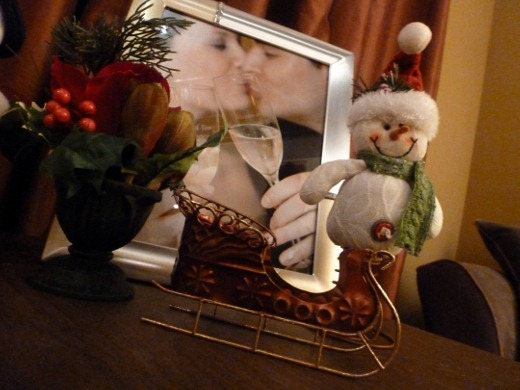 Since yesterday was December 1, I allowed some holiday cheer into my household. 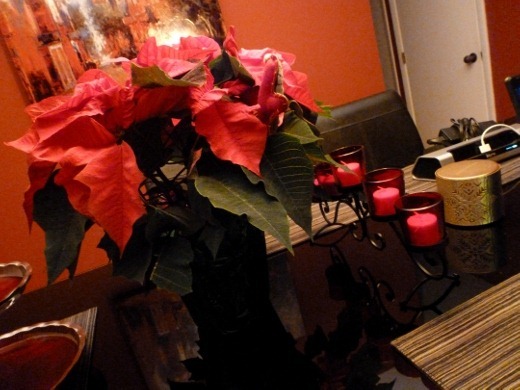 I think everyone at Meijer had one of these poinsettias in their cart this weekend! That, and a 5 lb. carton of clementines (me too). I put away my turkey decorations and got out the Christmas decorations, while sipping warm Chai and listening to the Classical Christmas station on Pandora this afternoon. 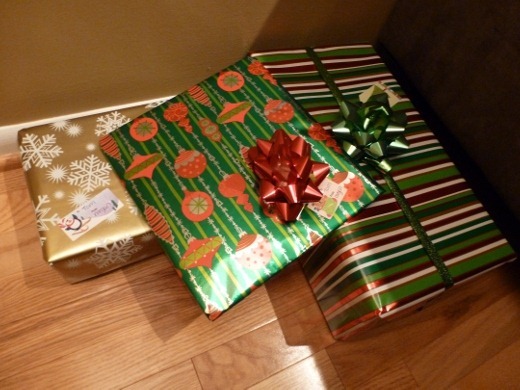 I also wrapped a few gifts to keep out any snoopers. 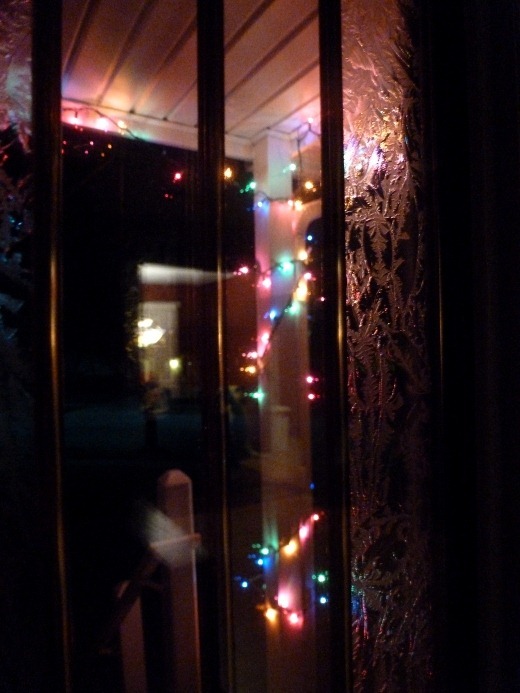 Peeking out from our front door, I can now see Christmas lights on the porch! The stockings are hung by the chimney with care on the media stand. Yeah, those are my feet. Aaaand we have homemade cookies! The huz’s grandma kindly hooked me up with some quality Penzey’s cinnamon and crystallized ginger last weekend. 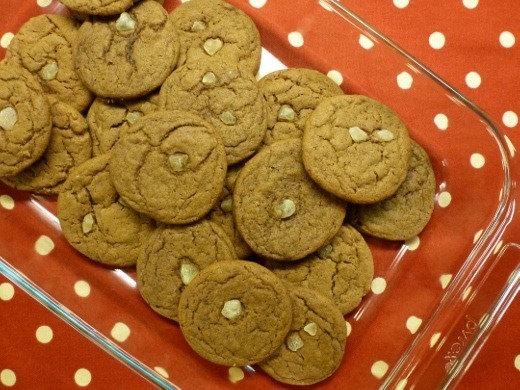 Since I had everything on hand to make “Faye’s Spice Cookies,” a recipe card brought to me from Penzey’s, I simply had to make these. 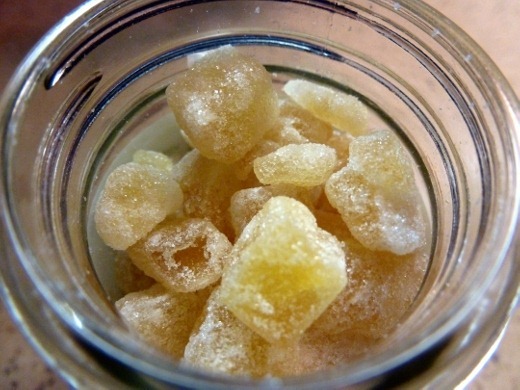 Pretty crystallized ginger! This is the first time I’ve ever tried it. It is yummy – tastes like candy. 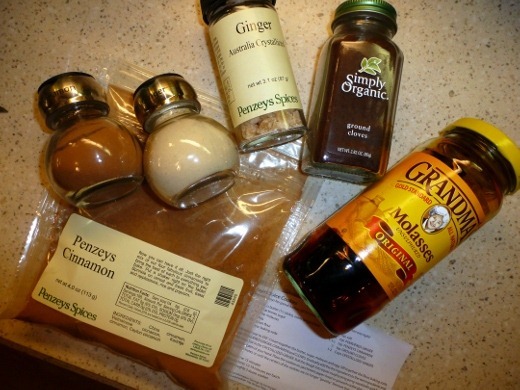 Dry ingredients, including several warm spices – cinnamon, cloves, and powdered ginger. 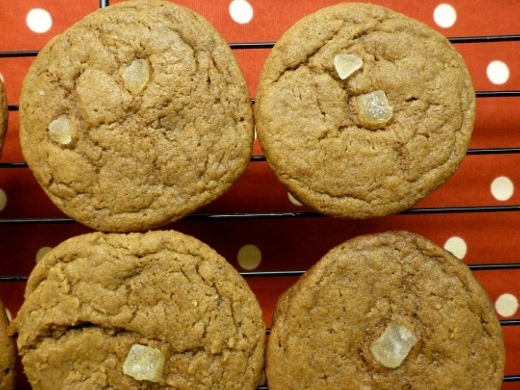 Rather than using up my supply of crystallized ginger and mixing 1-2 cups of it into this cookie batter, as the recipe suggests, instead I simply topped each cookie with a piece of it. These Spice Cookies were off the chain, yo. And by off the chain, I mean super delicious. 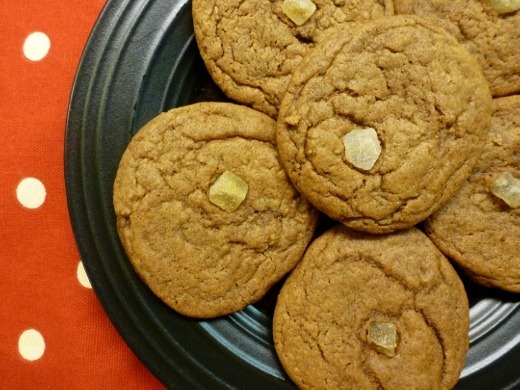 These Spice Cookies were so chewy, buttery, and full of warm spicy flavor – the huz and I couldn’t get enough! Probably the best cookies I’ve made this year. (Don’t you love my new holiday placemat!?). I highly recommend this recipe! I will most definitely be hanging on to this one. 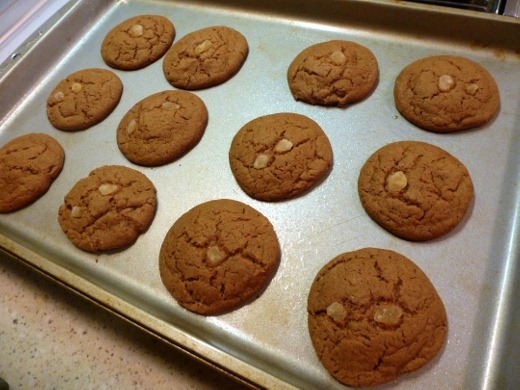 Preheat oven to 350 F. Cream together the butter, sugar, molasses, and egg with an electronic mixer. 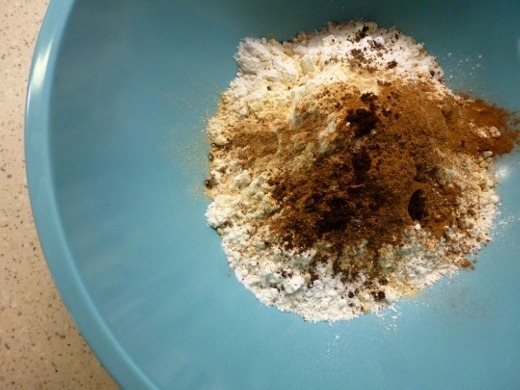 In a separate bowl, mix together the flour, baking soda, salt, powdered ginger, cinnamon, and cloves. Gradually add the dry ingredients to the wet ingredients and mix well. 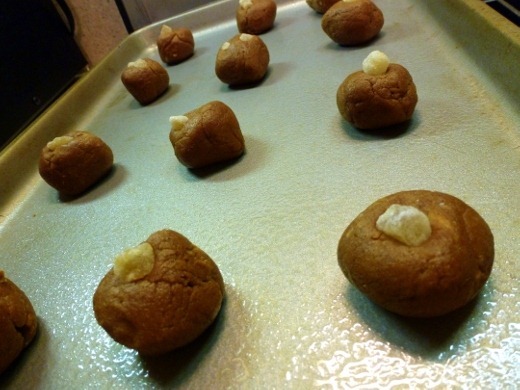 Roll the dough into ping-pong sized balls and place 1-2 pieces of crystallized ginger on top of each ball. 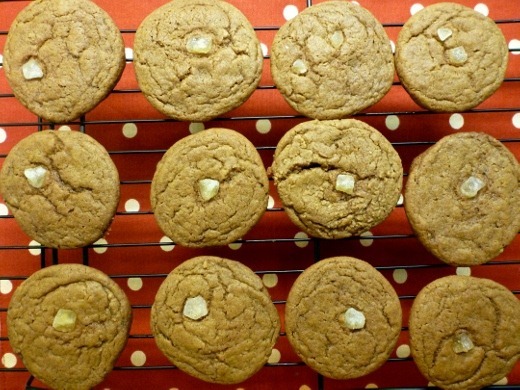 Place balls on a greased cookie sheet. Bake for 12-14 minutes. 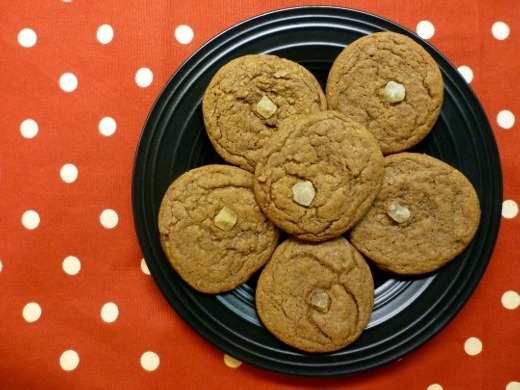 Remove from baking sheets to cool. Pingback: Holiday Favorites Survey « Meg.Goes.Nom.Nom.